Competitive Discounts for Vector NTI Users - Save up to 50%! Annoyed that Vector NTI is no longer free for Academics? Thinking about moving away from Vector NTI to a modern sequence analysis application? Do you want to run on a recent version of OS X? If so, you may be interested in a special offer we have for ex Vector NTI users. As a competitive upgrade offer, we will give you a 25% discount on a new MacVector license if you have been using the free academic Vector NTI license, or a 50% discount if you have been using a paid Vector NTI license. You may also be interested to know that using Vector NTI files with MacVector is straightforward. 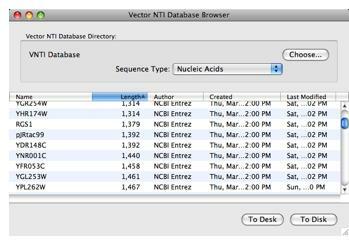 MacVector will import VectorNTI exported files in GenBank or EMBL formats. MacVector doesn't use an "import" function - you simply choose File->Open, select the file(s) and MacVector automatically works out the file format and reads them in. A new VectorNTI database browser was introduced in version 10.6 that allows MacVector to import sequences DIRECTLY from your VectorNTI database, without any need to copy or archive files. All sequence features and related information are preserved. MacVector follows the Genbank format for the features table and is always kept up to date with the latest Genbank release, so where possible MacVector will also migrate any old and deprecated features information contained in the VectorNTI file into the current up to date features nomenclature. MacVector is under continuous active development, and we have a major release approximately every 6 months with minor updates at regular intervals in between. We released MacVector 11.0 in August 2009 and expect version 11.1 in October/November and version 11.5 in Spring 2010. We are committed to both the Macintosh platform and to the development of intuitive sequence analysis software for molecular biologists. You'll need either your VectorNTI original invoice with serial number, or your original Vector NTI CD for the 50% discount offer. If you are upgrading from a free academic license, you'll need to send us a copy of the license you were sent from Invitrogen. Limit of only one offer per serial number. Contact our Sales Department now for a 'no obligation' quote at sales@macvector.com or use our handy online quote request form - be sure to let us you are interested in the Vector NTI discount promotion. For more details of MacVector pricing, please use this link.